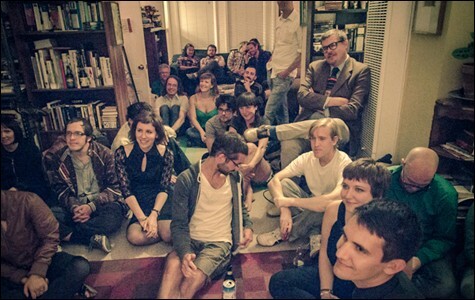 A weekend of poetry parties at various East Bay residences. 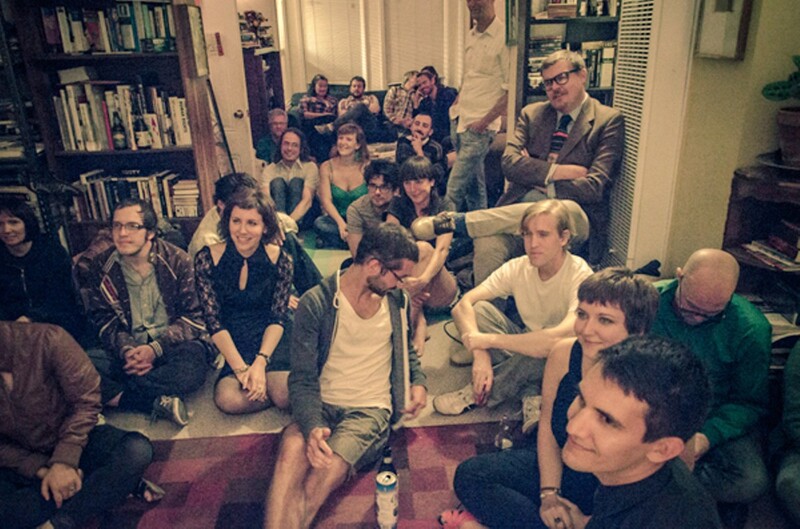 House readings, like the one at Woolsey Heights, provide a more intimate venue for poetry. The poems at the reading varied wildly: one poet riffed on the phrase "the possibilities are endless"; another touched on topics like Twitter, the Verizon Guy, and the actress Tippi Hedren; another reader nearly yelled her disaffected Occupy-tinged poetry. The reading — part of a series called Woolsey Heights, one of several curated house readings that occur across the Bay Area — was not an ordinary poetry event: The stage was the living room; the seats were couches, armrests, a bed, and the floor. The audience — with drinks in hand — included a miscellany of poets and writers, young and old; some had earned or were in the process of earning BAs, MFAs, or Ph.Ds; some taught, published, or edited; some were simply there for the poetry. Judging on the strength of the crowd, it was perhaps more accurately a poetry party. And this weekend, there will be several such poetry parties as part of the first-ever East Bay Poetry Summit. The event, happening May 24-27, will highlight several independently run house readings in Oakland and Berkeley — including Woolsey Heights, along with the series Manifest, Hearts Desire, and others — and will feature more than twenty non-local poets. In addition to the requisite poetry readings, the festivities will include a potluck, a barbecue, and, most likely, beer runs between readings. Four of the six scheduled events will take place in private residences — a fact that reflects a vibrant scene that results from using houses and otherwise unorthodox spaces as venues for poetry. While the East Bay Poetry Summit may have a party vibe to it, it will also be a serious event for poetry. An assortment of divergent styles will be showcased, and the readers don't fit any one aesthetic category, according to Brandon Brown, an Oakland-based poet and one of the summit's organizers. In short, he said, there will be something for everyone. For example, readers will include Bhanu Kapil, a poet and teacher at Naropa University's Jack Kerouac School of Disembodied Poetics in Colorado, and Dolores Dorantes, whose poetry is informed by the socioeconomics and violence of Juárez, Mexico. The aim of the East Bay Poetry Summit is to bring poetry into the real world — out of stuffy university reading rooms and fluorescently lit bookstores and into homes where the social environment is more conducive to building a community of poets. Attracting more people and highlighting this vibrant, indefinable scene is another part of the poetry summit's goal, said Brown, who started organizing house readings when he was nineteen, and who used to curate The (New) Reading Series at the now-closed venue 21 Grand. "At 21 Grand or at a house reading, you can actually turn someone on to poetry and get rid of the lie that poetry is boring and dead," he said. "It's a great proof of something we, as poets, know." House readings can be some of the most intimate venues for poets to listen to and engage with one another, and they're also a low-cost, hassle-free way to do so. For example, when 21 Grand closed because it lacked a cabaret license — which required expensive renovations to get — it ended more than ten years of The (New) Reading Series, and thus made house readings more essential to the scene. "[A house reading] is not subject to the same rigors of a nonprofit arts model," said Brown. "You can invite whoever you want to read and whoever you want to come, and whatever happens, happens." Yet certain aspects about house readings — the limited size, the restrictions on promotion, and the strangeness of going to someone's home — may deter some people. The goal of the poetry summit may be to attract more people to poetry, but its setup could make that prospect inherently limited. "There could be too many people," said Brown. "We're poets; we don't live in mansions. The summit is going to be a test of that. ... It may prove to be too much." The East Bay Poetry Summit is the brainchild of Andrew Kenower, the host of Woolsey Heights. He wanted the East Bay's independent reading series to collaborate for one event, partially as a way to include more people in this underground scene. "With a larger gathering, we have more reason to open it up," he said. But he isn't oblivious to the annoyance a literary event causes to his neighbors. At the most recent Woolsey Heights reading, he had to kick people off his back porch to keep noise levels down. When asked about whether he's had any problems with the cops in the past, he deflected: "Well, that night was just a party party." Keeping the poetry summit — and the rest of the poetry parties that occur throughout the year — open to the public has its disadvantages, but some organizers aren't too concerned. "I'm not worried about attendance yet; it'd be a great problem to have," said Kate Robinson, a poet who runs the reading series Manifest with her housemates Cheena Marie Lo and Brittany Billmeyer-Finn at their home in Oakland. "My neighbor has threatened to call the cops but I think it's hilarious," she continued. "Can you imagine the cops being called for a poetry reading, especially in Oakland?" Another problem for the East Bay Poetry Summit may be the passive efforts to promote. "Our promotion is pretty much word-of-mouth and Facebook," said Robinson. "We don't really push beyond that. Inevitably, we fall to the people immediately around us. ... We really just started doing it for our friends." Accordingly, many of these series have already established a tight-knit community of poets, which can be intimidating for newcomers. Yet two readings of the East Bay Poetry Summit — one at The Public School in Oakland and the other at The Long Haul in Berkeley — won't be held in private homes and can thus be more freely advertised. David Brazil, an organizer for The Public School's Hearts Desire reading as well as the summit, points to the awkwardness of entering a stranger's home as one of the issues facing the summit and other house readings. "You can't blast your address on the Internet" he said. "So the benefit with The Public School [reading] is that you can promote that address, people can go to the reading, make connections, and then find out about the smaller in-house ones." Though house readings may turn off some from attending, they've become a necessity. "If rents go up, or a cabaret license is needed, the doors shut for good," said Brazil. "It sort of gives the house reading a heroic underdog quality." With a new album on Hardly Art and facing a major lineup change, Shannon and the Clams works to stay its weird self.